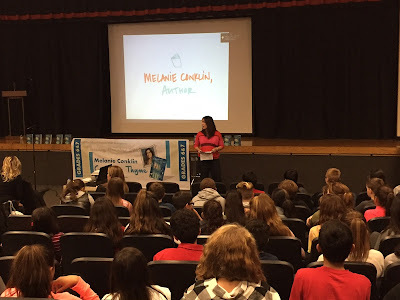 Now that I've spent a few months out in the world as a published author, I have a few tips to share regarding school visits. There are many different ways to approach the content of your school visit, but I'd like to focus on the organizational and planning aspects that can give the students the best chance of connecting with you and your work. As you know if you've ever done a school visit, volunteered for the PTA, or hosted a child's birthday party, planning special events takes a lot of time! It also takes a LOT of communication. Communication starts before you've even scheduled a school visit, with your website. Provide clear, organized information about school visits on your website. Consider including descriptions of the various programs you offer, your rates, and a large selection of photos to help interested schools gain a clear picture of what an author visit offers for students. It's also a good idea to provide recommendations from teachers and librarians once you have those. Make sure you include information on virtual visits if you offer them! 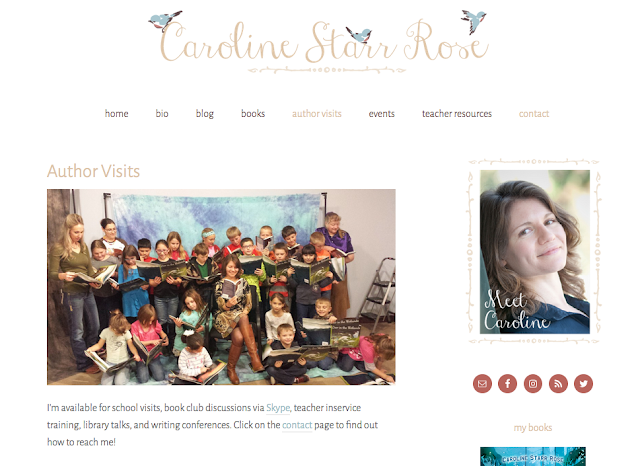 Caroline Starr Rose's website has a great author visit page! Which leads us to the third tip, regarding book sales. Arranging for book sales can be one of the most challenging parts of a school visit, especially as a debut author with less name recognition, or with a school that is unaccustomed to hosting authors. Some publishers offer school visit sales programs, so check with your publisher first. These programs often require book orders to be placed 6-8 weeks prior to a visit, but the shipping is free and the school is welcome to return the books that do not sell at no charge. Another option is partnering with a local independent bookstore. Many indies already have procedures in place for selling books to students (often at a discounted rate), so call around. If those options aren't available, I recommend asking the school's PTA to get involved. Send fliers home with students several weeks ahead of the visit, allowing plenty of time for checks to be collected and books ordered. This can be intimidating for schools that have not organized book orders before, but it is the same procedure as organizing a field trip. If you can find one enthusiastic person to head the task, it makes organizing orders much easier to manage. Author Jen Malone provides printable brochures with book order info included. The best way to prepare students for your visit is by sharing your work. 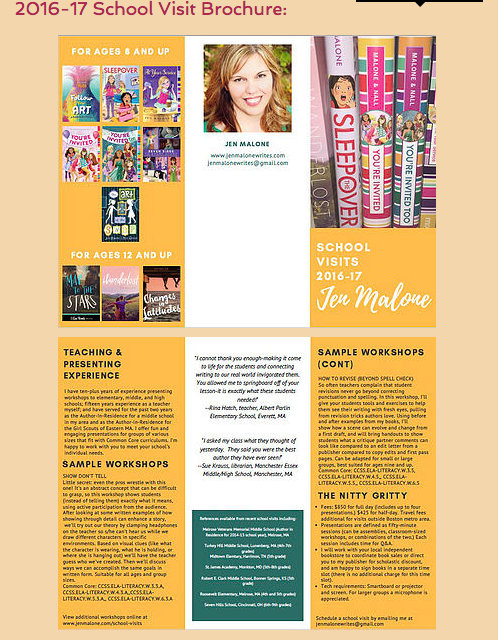 Provide a multi-chapter teaser that can be shared with school staff and ask that the teachers or librarian read these sample pages to their classes ahead of your visit. If your books are widely available, ask the librarian to order several copies for students to read in advance. Ask students to prepare questions in advance, too--knowing they will get to ask a question motivates students to participate! Use social media to connect and build excitement prior to a school visit! Many teachers and librarians are on Twitter and Instagram, which gives you a great opportunity to show readers your enthusiasm. I like to schedule Skypes on my website along with goofy gifs for each class. A regularly updated events schedule is a good idea. So are tweeting fun doodles, pictures, or questions for the kids. 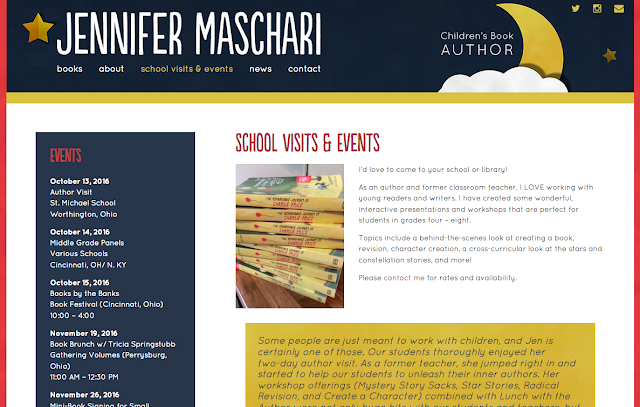 Author Jennifer Maschari lists upcoming events with her school visit info. Make memories that last! If possible, every child would love a token of your time together. I like to hand out bookmarks or stickers for every child at school visits. Author Natalie Lloyd writes classroom names on a chalkboard that hangs behind her during Skypes, which gives kids a great visual to keep after the visit. Kwame Alexander is known for taking selfies with every school group he meets. Kids are eager for ways to connect, so find one that works for you and you will leave them that much more excited for future author visits! Thanks for including me here, Melanie. I'll be sure to share on my own blog. Also, I've never thought of having a sample contract on my site. That's an excellent idea. Off to make that change. Thanks for the informative article. I would share from Creeks Edge University student. I am also a part of this firm.